Federation Personnel of Trill species. Host. 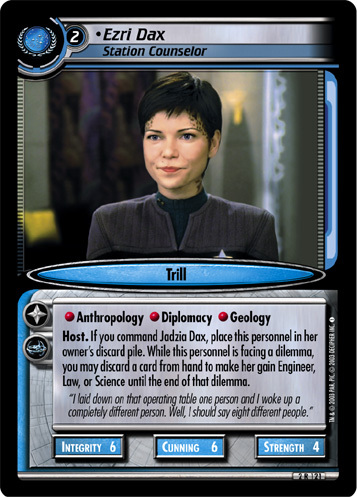 If you command Jadzia Dax, place this personnel in her owner's discard pile. While this personnel is facing a dilemma, you may discard a card from hand to make her gain Engineer, Law, or Science until the end of that dilemma. "I laid down on that operating table one person and I woke up a completely different person. Well, I should say eight different people." Characteristics: affiliation, Deep Space None related, discard a card from hand, enhance your skills (this card), Host, Trill species. There are 18 entries for Ezri Dax, Station Counselor (ST2E 2 R 121) at the Tradeplace (13 haves and 9 wants). Click here to see all trade list entries for this Rare card!